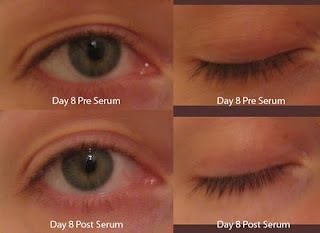 As I mentioned, I'm testing a Lash Boosting Serum and Double Extending Mascara for BzzAgent. Today marks one week since I've been using the products, and here's an update. 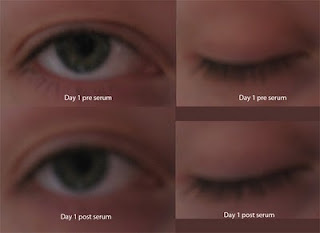 I've used the serum every morning before mascara and every evening after washing my makeup off. I find the applicator a little tricky--it's sort of like a mascara wand but not exactly (I'll post a photo next time!) and I keep getting gloops on my face, which isn't a pleasant experience when I feel all clean right before bed. I can't really tell a difference. Can you? I do love the mascara, though. It's the two-sided wand thing, with a white concoction going on first and the black mascara going on second. I like it a lot--I'll post pictures of that next time too.